A former Fermilab physicist is starting a crowdfunding campaign to build an antimatter drive. Gerald Jackson, a former physicist at Fermilab, has a big dream. He thinks that, given unlimited funds, we could have a fully demonstrable, antimatter-propelled spacecraft prototype ready in less than a decade. But since he doesn’t possess unlimited economic resources, and since the likelihood of any government underwriting a prohibitively expensive program in antimatter propulsion technology is pretty remote, he’s decided to turn to the guerrilla funding tactics of the 21st century: He’s starting a Kickstarter campaign. The idea is to raise $200,000 to crowdfund initial antimatter propulsion research for Jackson’s company, Hbar Technologies. It’s an ambitious goal, but the potential rewards are staggering. The creation of a functional antimatter engine would mean drastically reduced travel times for space probes, both within the solar system and in the interstellar spaces beyond. With potential velocities of 40% of the speed of light, it would mean that the stars would suddenly come within our reach; a journey lasting as long as the voyage of the New Horizons probe to Pluto would take us, not merely to the outermost bodies in our solar system, but to whole systems of planets circling nearby stars. Some experts assert that a more realistic estimate of such a spacecraft’s speed would be about 0.10c (10% of the speed of light), but even this would represent a fantastic speed that is utterly beyond anything we have today, and it would still put a probe in the Alpha Centauri system (the closest alien system to our own) in just 40 years. The problem is twofold: devising a lightweight propulsion system that doesn’t outweigh the payload by orders of magnitude; and actually getting one’s hands on significant enough quantities of antimatter, a notoriously difficult substance to come across (which, incidentally, is fortunate for those of us made of normal matter). Jackson thinks he has a solution to the first problem. “[M]y Hbar partner, physicist Steven Howe, and I came up with a very light propulsion system whose mass was comparative to the payload—an antimatter sail,” he explains. 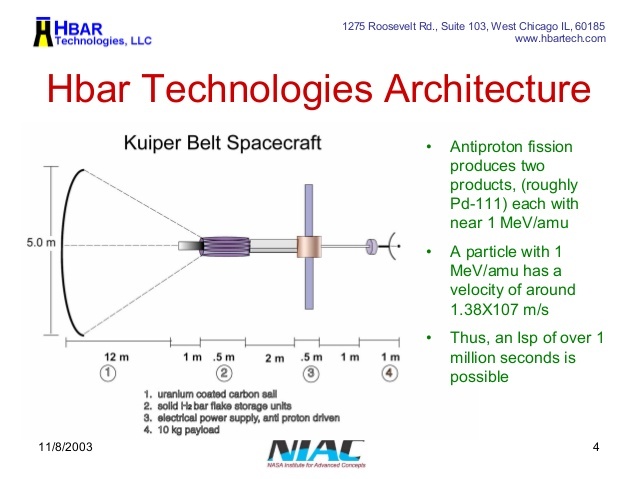 Schematic diagram of the Hbar Technologies concept for an antimatter space probe. Credit: Hbar Technologies, LLC. As far as the antimatter production problem—that may be a bit more difficult. Antimatter on Earth can only be found where humans have created it, deep in the hearts of the world’s most powerful particle accelerators—one antiproton at a time. Jackson and Howe estimated that only 17 grams of antihydrogen would be required to power their antimatter drive, which doesn’t sound like much; however, less than one gram of the stuff has been produced, and none of it has been contained for much more than a day. So to sum: It’s very difficult to store, and its production would require a multi-billion dollar particle collider solely dedicated to churning out antimatter day after day—a fantastically expensive project. Still, Jackson continues to dream, and it is of such stuff that the future is built. He thinks he’s solved the containment issue, and he wants cash to build a proof-of-concept. The rest, he hopes, will follow in due time. Briefly, the spacecraft design outlined by Jackson and Howe is as follows—the probe will consist of four parts: A carbon “sail” coated with depleted uranium, a storage unit containing the requisite antihydrogen in solid form, an antiproton-powered electrical energy system, and a robotic imaging and instrument package (the science payload). The actual motive principle behind the antimatter drive is a curious one. The antihydrogen is used to induce fission, and will produce 2 GeV (2 billion electron volts) of power—far in excess of anything standard chemical rockets generate. Upon striking a depleted uranium foil within the spacecraft, the antiprotons cause the uranium to fission, producing two “daughter” byproducts which are emitted in opposite directions. One of these byproducts slams into the uranium-coated sail, imparting its momentum to it like wind bellying the cloth sails of a terrestrial clipper ship. The other byproduct is exhausted like a conventional rocket propellant—that process of “leaving something behind” quoted in the film Interstellar as the only way mankind has ever found of getting from one place to another in space. So there are really two propulsive engines at work simultaneously, which (theoretically) cause the spacecraft to accelerate rapidly to appreciable fractions of the speed of light. It’s an interesting proposal, and well worth investigation. Perhaps, with Kickstarter funding, Jackson and Howe can start the serious business of making this science fictional technology a reality. That said, they estimate a further $100 million is needed to develop an Earth-based test to prove that the technology actually works…so that may only be something our progeny get to see. “Crowdfunding may be a good way to show interest in the project when it comes time to find bigger investors or governmental support,” says Jackson. After that, with sufficient will, and a couple of billion dollars burning a hole in one’s pocket, dispatching antimatter probes capable of 0.40c to the near stars shouldn’t be a problem at all.